Typography lovers are going to have to pinch themselves to make sure they’re not dreaming when they see this epic fonts bundle. With 33 typefaces at 99% off it’s Design Cut’s biggest font deal yet. This isn’t a collection of cheap amateur fonts, each one is a best seller with incredible quality. 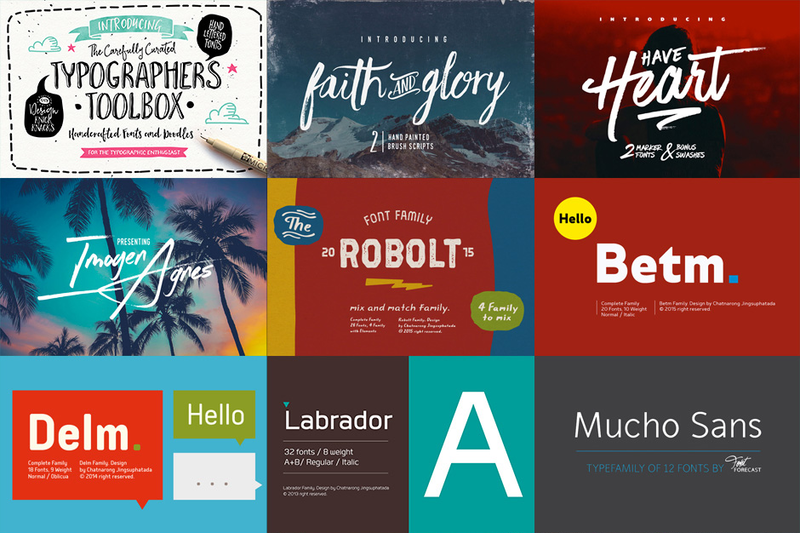 A single font alone would usually cost more than the entire bundle, but for a limited time this full collection can be acquired for just $29, saving a massive $2,500 off the total value. You could buy the top spec 5K Retina iMac with the money you’re saving! That’s how big this deal is! The Typographer’s Dream Bundle contains 33 best selling typefaces, each containing multiple fonts as part of its complete family. 399 is the total number of individual fonts in the entire collection when you add up the various weights and styles. This adds huge variety to your font library and provides the versatility to allow you to make perfect font pairs in your designs. 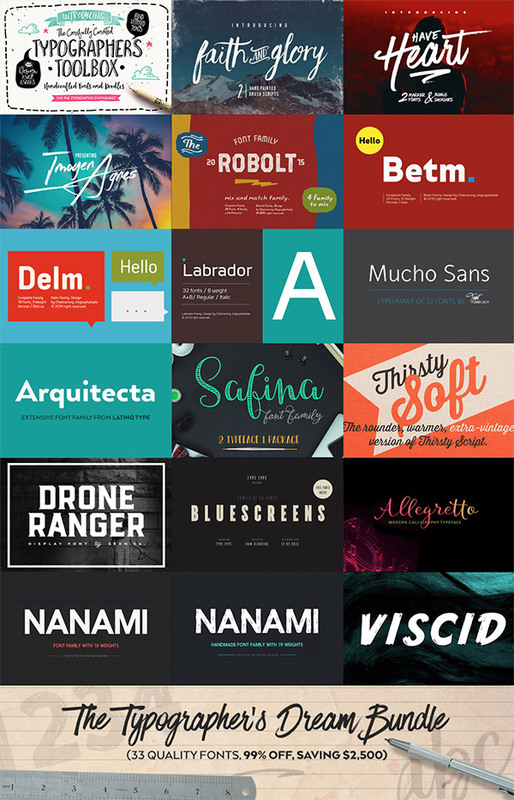 This is the Inception font deal; a bundle within a bundle! The Typographer’s Toolbox is a collection of 16 original, hand drawn fonts, giving you the ultimate selection of different calligraphic and script styles. Faith & Glory is a set of 2 hand painted brush fonts, designed to perfectly combine with one another and allow you to create beautiful typography with a personal touch. Have Heart is a set of 2 hand-made marker pen fonts, designed to allow you to create stunning hand-lettering quickly and easily. Also included is a set of 12 bonus swashes, ideal for giving your text that final touch of finesse. Imogen Agnes is a hand-made, signature-style font designed to create stylish lettering quickly and easily. It works great for personal logos, but also makes for a strong standalone script font with a bit of a retro vibe to it. The Robolt family is a complete collection of fonts from 4 different typographic styles, each with a retro or vintage feel from different eras. Inspired by clean and modern geometric lines, Betm comes in 10 very useful weights along with complementary italics. Delm is a sans serif with a geometric, modern look. It is developed in 9 separate weights ranging from Hairline to Black, each with corresponding slanted versions, called ‘Oblicua’. Labrador is a sans-serif that is both elegant and modern. It contains 32 fonts with 8 weights in A and B variants, giving you a choice between rounded and clean styles from light to black. Mucho Sans is a geometric sans serif type family that comes in six weights with matching italics. The design is very clean, yet friendly and modern. This is a contemporary type family that is excellently suited for both display and text uses. Inspired by American & European hand lettering from the first half of the past century, Arquitecta finds its own space as a great alternative for paragraphs in front of classics like Futura, Kabel or Avant Garde. Safina is a hand lettering typeface font with a blend of beauty, softness and elegance. It consists of 4 families, complete with uppercase, lowercase, numbers, punctuation, symbols and international language support. Thirsty Soft from Yellow Design Studio is the rounder, warmer, extra-vintage version of Thirsty Script. While the original Thirsty Script has a caffeinated look with sharp edges and pointed terminals, Thirsty Soft is warm and buttery smooth, adding friendliness and an extra level of vintage appeal. Drone Ranger is a geometric display family that includes 9 various styles for your design needs. Included in the family is a Sans version, a Serif version, and a Special Decorative version, and each of these have their own clean, oblique, and inked styles. Bluescreens is a high-quality font family which is designed specifically for cinephiles and directors. Condensed style contains five most popular typefaces: Thin, Light, Regular, Bold, Black and Italics. Allegretto Script contains more than 1000 glyphs. Each letter in the typeface has a few different swashes to add unique twists to each letter, and various options for common ligatures. Nanami is a brand new Japanese inspired type family. It consists of 18 individual weights ranging from Thin through to Black. It also has extensive support for over 27 languages. Nanami Handmade carries a quirky, mischievous charm. The font comes in two styles, solid and hand-drawn, each of which has eight weights. These sans-serif styles work well in small and large sizes, both on and off screen. Viscid is a painterly font based on styles found in old sign writers manuals. Painted using thick gloss paint strokes, it has imperfections for a handmade retro feel. It’s place is either on posters, billboards or somewhere it can scream and shout. Pay just 1% of the value of all these fonts! The Typographer’s Dream Bundle won’t be around for long, so if you want to make huge savings while refreshing your font library with quality, variety and value, be sure to grab this deal while you can! On top of this 99% discount is free extended licensing with all fonts, meaning you can safely use these typefaces in your client work and designs you intend to sell as prints or merchandise. this is by far the best font bundle ! This is indeed a dream bundle. Great for logo design, packaging and print ads… everything actually. its really a great to see the post like this which provides a meaningful data to someone who are new in this field. thanks for sharing it.. Thanks for all your hard work and great insights.